Vaccon’s Multi-port vacuum pumps combine a venturi with a multiple port manifold to easily distribute vacuum to multiple locations. The result is a compact vacuum generation and distribution system for End-of-Arm Tools and applications where one pump powers multiple cups. VP20-MP pumps have 4 vacuum ports that distribute vacuum equally to 4 locations with “Home-Run” plumbing. The streamlined design minimizes vacuum loss, maximizes vacuum flow and speeds cycle times for safe, efficient lifting operations. 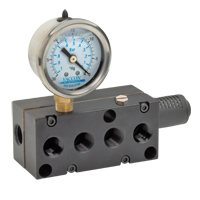 A 1.5" diameter glycerin filled vacuum gauge and silencer are standard. Options include a miniature vacuum sensor/switch to provide an electrical signal for vacuum achieved/part present and to alert failures. An integrated solenoid valve for vacuum control is also available, with an optional M8 3-pin connection. A separate port can be plumbed to a compressed air source to provide a blow-off. The manifold design allows one compressed air connection to feed blow-off air to all vacuum locations simultaneously, saving the need to plumb separate blow-off lines. Dimensional data for the VP20-MP / VP20BV-MPMidSeries multi-port venturi vacuum pump is presented in 2D drawings, with all critical dimensions and port thread sizes displayed. Both imperial and metric units are included. Performance data for the VP20-MP / VP20BV-MPMidSeries multi-port venturi vacuum pump is displayed, listing air consumption, vacuum flow at various vacuum levels, and evacuation times (for 1 cu. ft. or 1 L volumes). Data is presented in tabular and graphed formats, in both imperial and metric units.